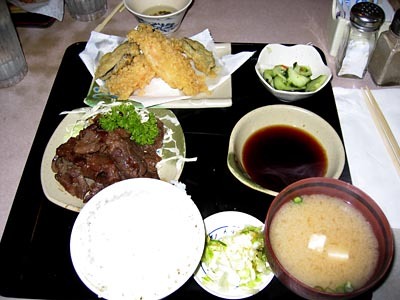 Shrimp tempura and teriyaki beef combo dinner at Teshima’s Rest. in Honalo, yummy atery-clogging food. But oh so good. Delish! Good thing you got the combo; usually the portions aren't big enough there. There's an L&L on Ball Road in Anaheim (about four miles from where I work), and I've been there twice. I could barely finish my beef teri/chicken katsu mixed plates. I'm out of practice! There are two women in the bureau with Hawaii ties, and they love going there too.